Last week I posted about my eventually successful visit to Cwm Idwal in Snowdonia. But alongside the story of the photographs there was a quite different narrative running in parallel. On my first visit to the Cwm, amongst the huge boulders below Twll Du, I came across some small brown birds. I quickly twigged that they were twite, which, strangely enough, I had been reading about the previous evening. As far as British birds go they are probably the supreme example of the “little brown job”. Visually there are no distinguishing features at all unless you can see the pale pink rump patch, but they do have a distinctive twanging call, which confirms their identity. At first it was just a couple of birds, then a juvenile begging food from a parent, then a bird leaving a possible nest site and finally a flock of 15 – 20 birds. On my return to Idwal Cottage I looked around for someone to report my sightings to. There was no-one but a girl from the National Trust, who “thought she had heard of twite” but that was it. While I drank my coffee I noticed the nearby organic burger van, whose owner, Gwyn Thomas, the local farmer, was conversing with customers. My partner has worked with him so I went over for a chat. Eventually I brought up the subject of my sightings. To my surprise and delight he is quite an authority on twite! Along with several other farmers in Nant Ffrancon he grows a seed crop for them to feed on during the autumn before they move down to the coast for the winter. I’m sometimes not a great admirer of farmers but this man is a star! During our conversation a car drew up alongside and the driver came over. I recognised him but couldn’t put a name to the face. Gwyn left me with him and a tentative conversation began. I wondered aloud if I had seen him on TV. “No, I work on radio…” he replied. Not really a great help! “I did a book with you!” he added. It came to me in a flash. It was Dei Tomos, the author with whom I had worked on the Welsh version of “Wales at Waters Edge”. I buried my head in my hands in embarrassment! To be fair though, it was hardly a collaboration and we had only met once, and he couldn’t place me at first either. The social aspect of my weekend continued the following morning. Back at Ogwen Cottage after a third unsuccessful visit to the Cwm, I was drinking coffee by my van. A familiar figure appeared. It was Martin Ashby, owner of Ystwyth Books in Aberystwyth, and one oldest and most valued friends. He was with his mate Nigel Dudley and just about to set off on a long walk up in to the Carneddau. I reluctantly turned down their invitation to join them. Just a note on the photograph above. While dull, cloudy conditions are usually the kiss of death for most “big” landscapes, they can be ideal for details within the landscape. 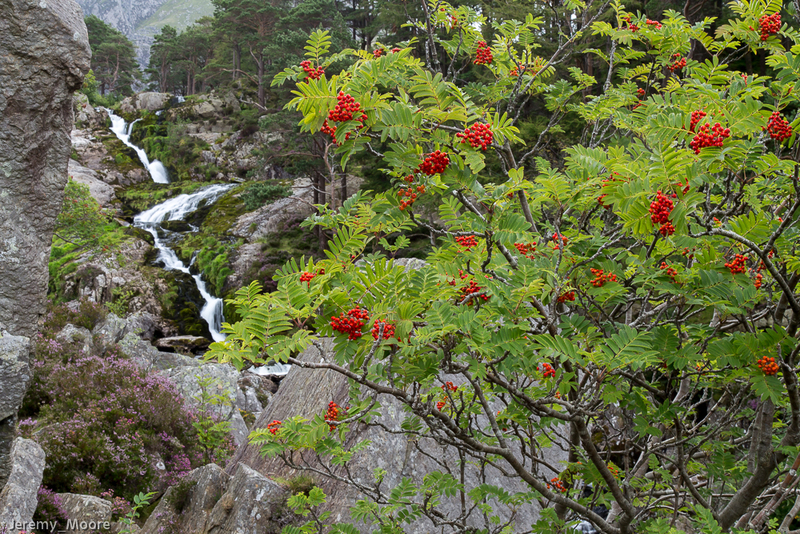 This lovely rowan tree was just below Ogwen Cottage. To read more about Gwyn Thomas and his work in Cwm Idwal, click here. This entry was posted in Uncategorized and tagged birds, BTO, Cwm Idwal, Cymru, landscape, Ogwen Cottage, photography, snowdonia, Twite, wildlife. Bookmark the permalink. 1 Response to More from Cwm Idwal. I’d never heard of twite but they look like an engaging little bird. Rowan berries always cheer me up when I see them, they’re such points of brightness in the landscape at this time of year.